Earlier this month Twitter gave an overview of its plans heading into the future and what new features they had in the works for users as the service progresses. 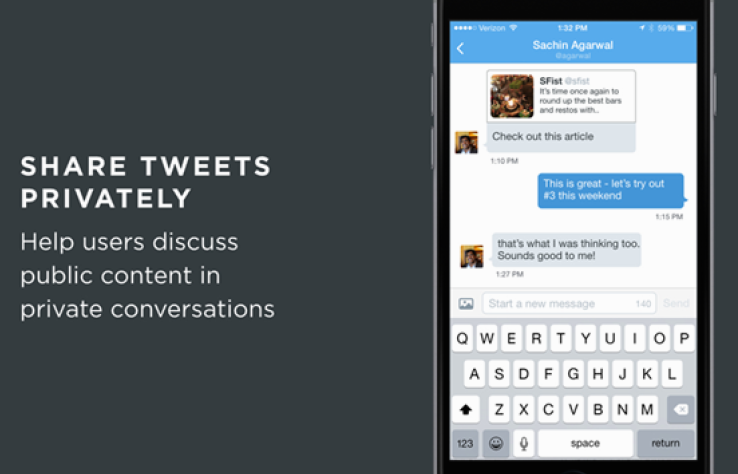 One of those features mentioned was the ability to share tweets via DM has now gone live and can be used from today. On the desktop you can access this feature by tapping the “More” icon and then choosing ‘share via direct message.’ On the mobile platforms you can long press a tweet in a timeline which will provide a popup menu to allow you to share that tweet via DM. The person who receives your shared tweet will get a notification and the tweet itself will be displayed directly in the conversation. It is not exactly a high end or high demand feature however it is a nice addition for people who like to have private conversations on Twitter and is a way of translating public content seen on your feed into a private message with ease. Twitter has been slowly exploring the area of direct messages recently by expanding its functionality by adding support for sharing photos and now sharing support for sharing tweets. Twitter has promised big changes and improvement to messaging down the line, previously citing that they understand the importance of messaging in apps these days. The latest feature for Twitter will be rolling out today, there is no app update however when it rolls out to you, you will see a notification in your mobile app feed explaining how it works.